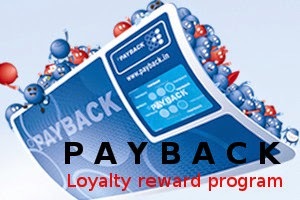 What is Payback loyalty reward program? How to redeem My Payback points? How to check your Payback points using SMS? How to Merge multiple PAYBACK accounts to one? How to accumulate payback points earned on multiple card to one payback account? How to Block your Payback card using SMS? How to contact Payback Customer care? PAYBACK is a loyalty reward program, through which your can earn reward points for a purchase at specific locations or for using shopping cards, debit / Credit cards etc. For example some Debit / Credit card providers (Like ICICI Bank) partners with Payback to give their customers reward points on purchase using their card. Such customers will be given a PAYBACk account number and a PIN number. When a purchase is made using the respective credit or debit card, some points will be credited to your Payback account. On each purchase using these cards your payback points will get accumulated. You can redeem your PAYBACK points as Gift coupons or any other products listed at payback website. If the product's Point value matched your Payback earning, then you can buy it. The product will be delivered to your registered address. How to Club or merge multiple payback card to one card? Can I link more than one payback accounts? If you have more than one Payback cards, the you can request Payback to merge those cards into one. There are 3 options. Click on the "Contact us" on top of the website www.payback.in ( https://www.payback.in/pb/contactUs ). Choose the Category as "ACCUMULATE YOUR PAYBACK POINTS INTO ONE ACCOUNT"
Enter Payback Card to be Retained and Card to be Cancelled and submit the request. Points available in the card that is to be cancelled will be transferred to the card that is to be retained. * If these two payback cards have different email address linked to it, then you should call customer care. type < PBBLOCK > and send it to 9212146468 from the registered mobile number.